Designed for flexibility, durability and style. To safely handle the rigors of a floor environment, the RFL Series is constructed of all steel, including the carpet rim. these boxes are available in two depths: (4-11/16” or 3-1/4”). 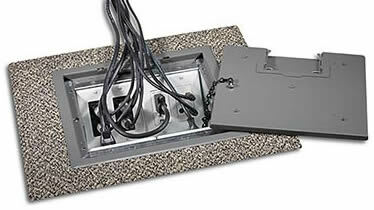 A 3-1/4” deep floor box with 4 standard single gang openings, 2 on each side of the box. One divider is provided so either of the compartments may be divided for power and data use. and 2 single gang openings on the bottom for data. The data plate insert is removable for added room in the box. A 4-11/16” deep floor box with 4 standard double gang openings, 2 on each side of the box. divided for power and data use. The carpet rim and cable exit door are available in Gray, Black or Clay. A sampling of covers in standard colors is below.